It comes as something of a relief for Design daily that Australia’s newest furniture fair, Denfair, is over. Not because it wasn’t good – it was without a doubt the best furniture fair Design daily has attended in Australia in 16 years of working in the design industry. The relief comes through not having to worry about whether my first stand design would be built in time or whether it would fall down during the event. I’m happy to say that it was delivered, installed and stayed upright for the event’s duration and even won the Denfair Small Stand Award. All-in-all it went pretty well. But that’s not what this post is about. Not only was Denfair well attended and full of Australia's best importers, retailers and independent designers but a large number of brand new Australian designs were launched to coincide with the event. 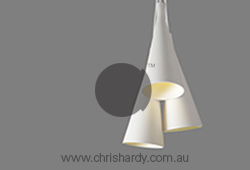 The caliber of these new designs proved that Australia has what it takes to be part of the global design community. Coco Flip's new 'Mayu' pendant lights in geometric shapes in translucent cloth. 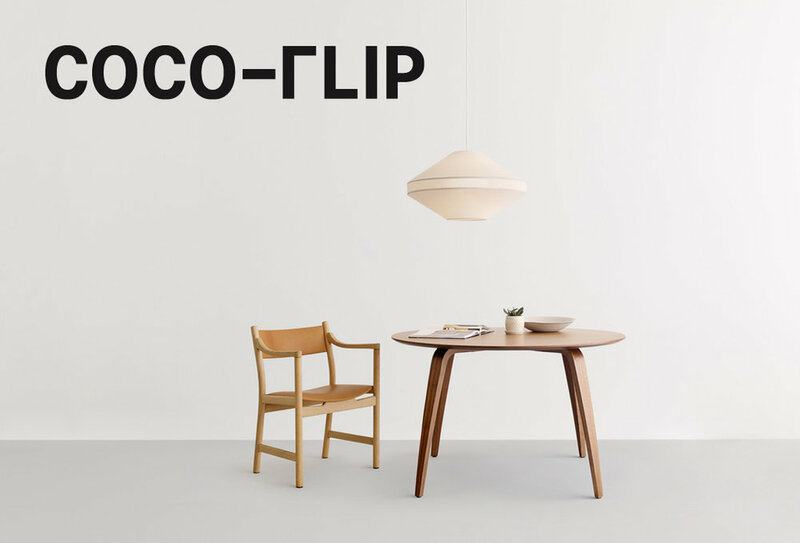 Kate Stokes is a Melbourne based designer who with Haslett Grounds goes under the moniker Coco Flip. The studio / brand's new lighting range is made up of five different shapes that combine cylinders and cones to great effect. Made from a fine translucent cloth, the lights provide a soft glow while adding a wonderfully graphic quality when hung in groups. The lights were launched at Denfair on a deep blue background (as shown above) to highlight this. Another well established Melbourne studio and brand, Lightly, released a well priced floor and table light collection with a strong French mid-century feel called 'Eileen'. 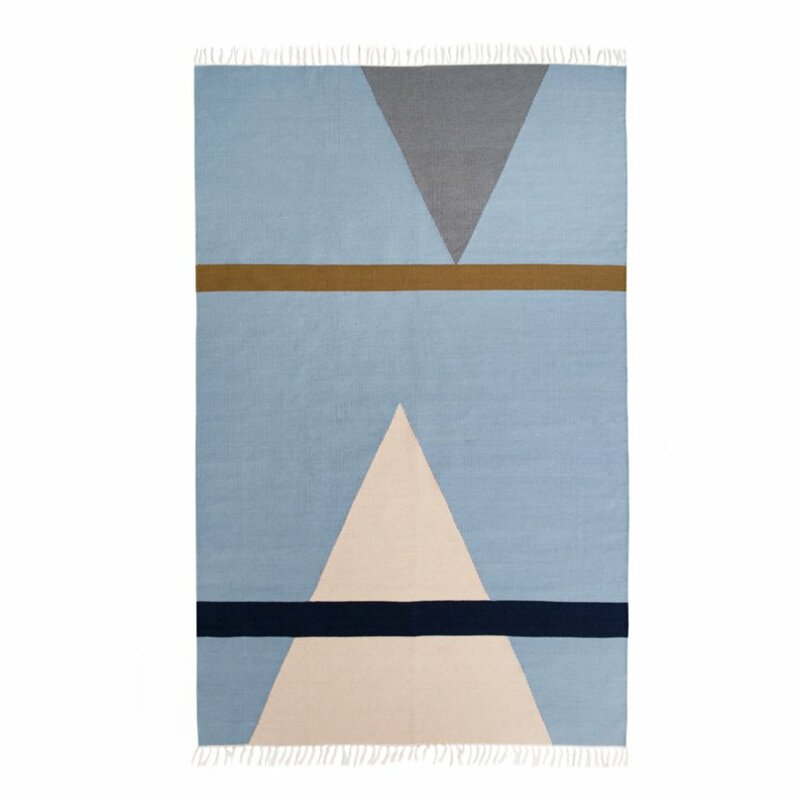 The brand also introduced a great rug collection of three geometric rugs in woven wool. The 'Desert Shapes' and 'Lightly Fort 2' rugs are available in 160 x 230cm while Lightly Fort 3 is available in a larger 200 x 300cm size. Founder, Cindy-Lee Davies has operated her studio and brand since 2005 out of a space in Collingwood where she now also has a small retail showroom. The lamp on the left is by Cindy-Lee Davies for Lightly while the stool on the right is called 'Grain' by Jack Flanagan and Calum Campbell. Flanagan and Campbell's stool features a sand cast seat with screw in legs and a cast foot ring. 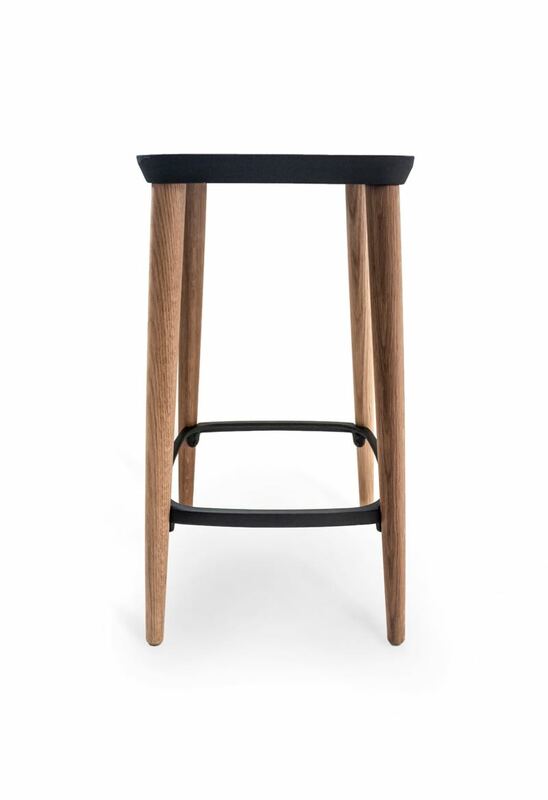 Originally designed in 2013, the stool has won numerous awards but is now available in it's final form with oak turned legs and either a polished or a matt painted cast alloy seat. The stool is sold through Cult. The new 'Pieman' collection from Australian brand Dessein, with new pieces by Simon Ancher, Nathan Day, Tom Fereday and Marcus Piper. The shelving by Ancher is flat pack and the leather sling of the dining chair is removable. Furniture brand Dessein was founded by Michele Chow in 2012 and this year at Denfair the brand changed tack from its previous sustainable rubberwood designs by Adam Goodrum, Justin Hutcherson and Jon Goulder (the TAP collection) and produced a new range from salvaged hardwoods sourced from the surrounds of Lake Pieman in western Tasmania. This time around the designers included Sydney based Tom Fereday, designer maker Nathan Day from Dunsborough in Western Australia, Launceston based Simon Ancher and designer and Mezzanine magazine editor, Marcus Piper. The designs are uncomplicated and strong, showing a deep respect for the qualities of the timber. The 'Float' Interlocking candle holders and serving trays by Marcus Piper for Dessein. The basic form flat panel with hole is also the basis of an electric lighting range with one to three globes (as seen in the previous picture above) and wall mirrors. The collection came about through a series of collaborative workshops in Tasmania where the designers visited the area to understand the origins of the timber and to be inspired by the eerie location. The timber for the collection was sourced from Hydrowood, a specialty timber company which works with submerged and other dead native trees that ring Lake Pieman - a man made lake created by damming the Pieman river for a hydro electric scheme in 1987. The result of this huge unnatural intervention in Tasmania's wilderness makes a sad sight for environmentalists but after twenty five years in their watery grave, the high quality and often rare timbers are at least now being put to some significant use. The result in this instance is a beautifully crafted collection that includes a dining table, desk, dining chair, shelving, interior objects and pendant lamps in exquisite timbers including celery top pine, huon pine, Tasmanian blackwood, myrtle and sassafras. The 'Pieman desk' like the dining table shown earlier, is by Nathan Day. The 'Pieman' chair is by Tom Fereday for Dessein. “The collection evolved through a series of workshops held in Tasmania, Western Australia and many Skype conferences!” Dessein founder, Michele Chow. The 'Dion' daybed by the Evie Group with the new 'Oliver' planters in the background. Alex Gilmour and Dominic Chong of Sydney design studio Evie Group also showed a number of new designs including a lovely daybed called 'Dion' The blackened oak base features a signature cross-brace that provides both strength and a design feature. In addition to 'Dion' the studio launched their new 'Oliver' planters and side tables (also shown above), in black powder coated frames or in polished brass. The tables feature a marble top and asymmetric base. The group also released a table called 'Niles' that uses a leather sling for storage beneath a timber top on a fine metal frame in black or brass. The 'Oliver' side tables in marble and brass by the Evie Group (Alex Gilmour & Dominic Chong). 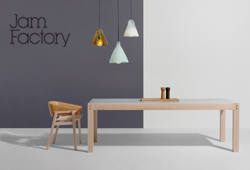 One of the most significant names in Australian craft - the Jam Factory - is rapidly becoming equally as important in furniture design. Headed up by Jon Goulder, the furniture section of 'the Jam', as it is fondly called, launched a new range of products that run from mouth blown glass pendant lighting to chairs, storage, stacking stools and shelving. Whats more, the items are all purchasable through the Jam Factory online shop at very reasonable prices. Part of the new Jam Factory furniture range - the table by Adam Goodrum, shelves by Daniel Tucker, chair by Rhys Cooper. The 'Loop' shelving comes in a variety of heights and is made from black stained oak with powder coated steel shelves. The collection curated by Goulder as head of furniture at the Jam Factory, showcases a range of fine furniture skills while making accessible and highly functional objects. While Jon Goulder and Adam Goodrum are two of Australia's most well known furniture designers, the collection features the work of Rhys Cooper a young up-and-coming designer who has been working at the Jam Factory for the last twelve months as part of it's associate system, along with that of second year associate, Daniel Tucker. Images of Jam Factory products shown here are by Sven Covak. Henry Wilson's 'Block Module' cabinets - part of the new Jam Factory furniture collection. Extremely simple but with beautiful details like exposed dovetails plywood internal drawers and ball bearing runners. Available in American rock maple or walnut. The collection also features the work of Sydney based designer Henry Wilson who has recently completed his second Sydney store for Aesop and who's refined and astonishingly reductive aesthetic has won him numerous awards and accolades since completing a post-graduate degree at Design Academy Eindhoven in 2010. 'KC' light by Karen Cunningham, 'AG' table by Adam Goodrum and 'Cusp' chair by Rhys Cooper for the Jam Factory. The light is sold in 6 colours and two sizes, the table in 3 sizes with oak plywood or marble top. The chair comes in maple or walnut. Adam Goodrum' involvement with Cult started a few years ago with the 'Molloy' range (seen below in the sidetable and wooden chair) but continues to expand in a host of directions. This year at Denfair his 'Bower' range of commercial pieces in felt and timber was launched with a definite attempt to soften and add tactility to the hotel and office interior. Goodrum won the Denfair Award for Best Designer last week. He's going to have to be barred from competition to give others a go - he keeps winning everything! Adam Goodrum's 'Bower' range for Cult takes wood and felt to the commercial sector with room dividers, desks, lounge chairs and sofas. Photography Brooke Holm, styling / art direction, Marsha Golemac. Anne-Maree Sargeant's ID x THE SNAP returned this year with 16 designers including Dennis Abalos, Frag Woodall (Mr Frag), Coco Reynolds, Dezion Studio, Yellow Diva, Ben Tovim, Marc Pascal and Andre & Lydia Hnatojko. 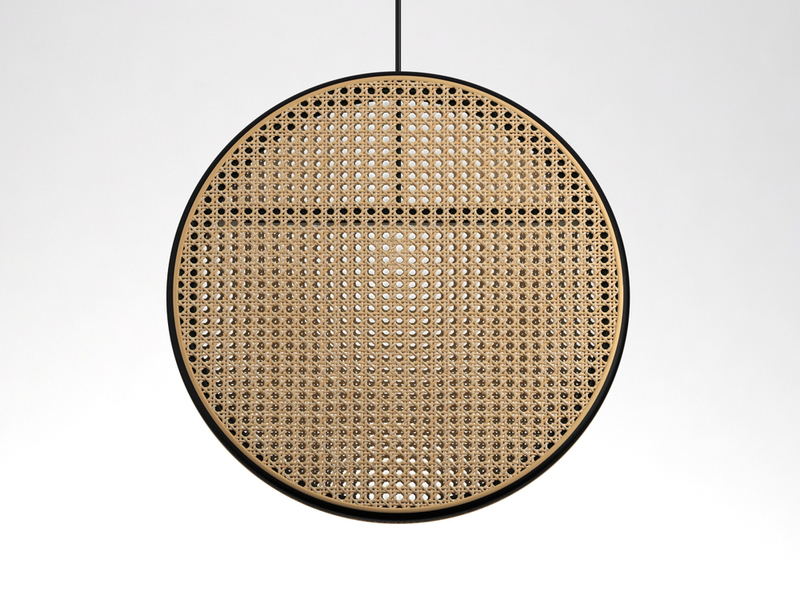 The later's 'Laal' lighting range was a standout as was Abalos's interesting take on bentwood and rattan. These two collections were joined by a couple of sneak peaks from Dale Hardiman's new 1-OK Club limited edition collection soon to be available as an online only exhibition and auction and some interesting new work by Ilan El who is well known for his innovative lighting solutions. The relatively established names listed above were joined by Eugenie Kawabata, Alex Fitzpatrick, Jonathan Biet (So Watt) Adam Markowitz and Luke Rogers. Melbourne timber bathroom fittings brand Wood Melbourne (founded by Oliver MacLatchy) and Max Hunt's Hunt Furniture were also part of the ID. x THE SNAP exhibition. Part of the ID. x THE SNAP exhibition with the new 'Laal' collection by Andre & Lydia Hnatojko. Photo: Nicole England. I have to admit that I am a sucker for bentwood furniture. The history of the style is so incredible dating back to the mid 1800's when Michael Thonet brought the world the first truly affordable chair through clever design and the development of mass production steam bending techniques. What is so great about bentwood is the fluidity of the method with legs becoming rails or armrests with minimal joints and sometimes just a few screws to hold the whole thing together. In a similar way Asian rattan furniture has a huge amount of appeal. It is highly sustainable as the vine grows like a mad thing in the tropics and it is easy to harvest and prepare. Dennis Abalos' 'Saddler' chair in steam bent celery-top pine and hand-stitched saddle leather. Dennis Abalos has a Filippino background and his design work often embraces rattan - a common material in the Philippines. This year at Denfair he launched the 'Jacaranda' pendant that is made from rattan with woven cane. The vaguely handbag shape of the light is actually based on the Jacaranda tree's seed pod. Lit with a LED strip along an internal rattan crossbar, the light offers a strong reference to the turn of the century furniture of Thonet while exploring a totally new shape. Abalos also designed a chair called 'Saddler' using the bentwood technique of steam bending but in this case it is in celery top pine and Abalos has restricted the technique to just a continuous back/arm rest. The wedge detailing in the tenon is highly appealing as is the hand stitched leather butthis of course means this will be a relatively expensive chair. Available stained black, in a rich brown or in natural celery top pine, the chair is light and strong with a slightly Spanish look. The 'Jacaranda' pendant light in woven cane and steam bent rattan. The design comes with either natural, white or black frames. Lighting is rarely part of the bentwood idiom but I believe it is something that is well worth exploring further. In Abalos' 'Jacaranda' design the rattan form combines with the patterned shadow-making attributes of woven cane. The American Hardwood Export Council has been supporting interesting exhibitions at other design fairs over the last few years - London Design Festival in particular but also as part of Wallpaper Handmade in Milan. Last week Australia got their turn with the Seed to Seat exhibition held at Denfair. Six Australian and New Zealand designers were briefed and required to come up with their own furniture product made exclusively from the American timbers: Cherry, Tulipwood, Ash and Red Oak. Participating designers included Adam Goodrum, Ben Percy and Anaca Studio's Anne-Claire Petre, interior designers Greg Natale and Todd Hammond, and New Zealand lighting and furniture designer, David Trubridge. David Trubridge's 'Recliner' in heat treated ash, designed for the American Hardwood Export Council's Seed to Seat exhibit. The designs ranged from a fluted CNC milled stool called 'EMI' by Anne-Claire Petrie to a striking black and white (charred ash and limed tulip wood) high backed bench by interior designer Greg Natale. All the designs were monitored for the amount of material used and time taken to machine and assemble the product so a total carbon footprint could be calculated for each design. In what came as a pleasant surprise to Design daily it seems that the amount of timber used in any one of the designs developed for the Seed to Seat project, can be regrown in less than a minute in American farmed forests. Quite how this is possible I'm yet to discover but the American Hardwood Export Council are proudly promoting the fact so it must be ostensibly true. 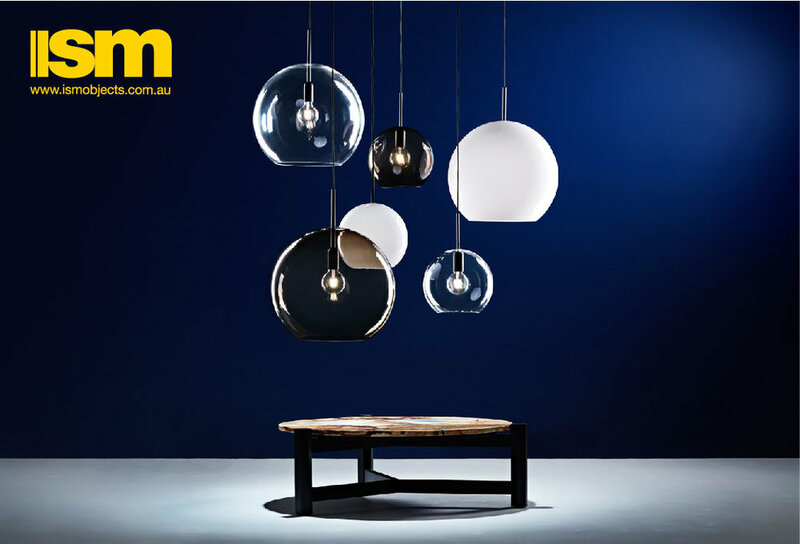 Volker Haug has been exciting Australians with his inventive lighting for over a decade. This year he pushed his graphic play on line to a new level with his 'Only U' pendant that defies gravity in a delicate balancing act. The clever wall fitting not only made a lot of people smile but also won the Denfair Best New Product Award. Volker Haug's 'Only U' wall fitting offers a delightful play on balance and words. Dale Hardiman is one of the founders of the limited edition design platform 1-OK Club as mentioned earlier but he is also a co-founder of LAB DE STU - his Melbourne studio co-founded with Adam Lynch and André Hnatojko. This year at Denfair the studio released several new products including the 'Bradley Copper' table range and the 'TimBer' range of tables and stools. The wire frame of Bradley Hooper comes in three shapes with either marble or plywood tops of varying diameters. The 'TimBer' range by contrast focuses on just one dimension of timber, repeated for legs, cross-bracing, rails and even reiterated in the thickness of the table's top. The Donald Judd-like result has a simple grid appearance and means the table will provide a natural foil for expressive organic shaped chairs while the stool works as a simple minimal element for contemporary kitchen spaces. Working in porcelain is a labour of love. The notoriously difficult material however seems to have met it's match in Gregory Bonasera and Anthony Raymond of Porcelain Bear. 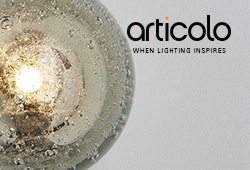 The Melbourne lighting and furniture company seem to be able to make anything in porcelain and do it with incredible flair. I don't know of any other company in the world that is making the variety of products in porcelain that they are with the possible exception of Twentieth Century icon Rosenthal. Porcelain Bear's 'Metro' table with marble base and top with drum shaped porcelain tile columns references the Paris metro. The 'Eido' pendant by Porcelain Bear presented as a seven lamp cluster. 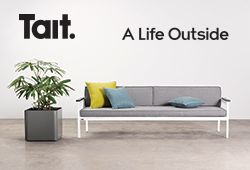 Trent Jansen broadened his already large 'Tidal' offering for outdoor furniture specialist Tait by adding a wheeled sun lounge. The design is incredibly fine and while delicate looking immensely robust being made from 316 (marine grade) stainless steel. The sun lounge is shown in it's beautiful naked form below but is also offered with a one piece outdoor cushion in a variety of colours. Trent Jansen's new 'Tidal' lounger and the previously released 'Tidal' side table - both for Tait. While there is still plenty more new Australian product seen at Denfair worth talking about, this post has covered the major new launches and needs to wrap up. Before I do however, I just wanted to indulge in a bit of personal pride - the SeehoSu stand that was mentioned at the beginning of the post. Made with friends Jeffrey Broadfield and Gary Galego, the stand took the simplicity of two materials - wood and Tyvek. These two materials represent the core materials of the three brands on display, Japanese brand Maruni, who specialises in fine timber furniture, Canadian brand Molo, who create furniture and lighting in Tyvek (including a marble topped dining table) and Gemla, a traditional Swedish brand (infact the oldest surviving furniture manufacturer in Sweden) that specialises in bentwood furniture and natural, organically tanned leathers. Okay, so none of this product is Australian but the stand was made in St Marys in Sydney's outer west, so sort of, almost, qualifies. The SeehoSu stand designed by Design daily to showcase Maruni, Molo and Gemla products. The stand was made from clear pine and white Tyvek with a limed birch plywood floor. A soft, calm and honest stand was the desired outcome.